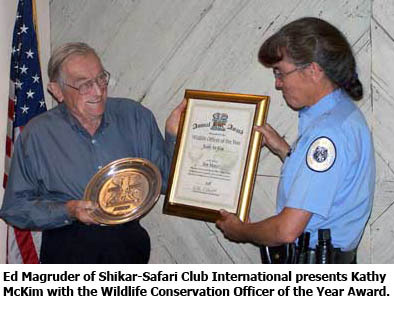 SANTA FE -- Kathy McKim, the Department of Game and Fish district wildlife supervisor stationed in Farmington, has been named New Mexico Wildlife Officer of the Year, a prestigious award sponsored by the conservation organization Shikar-Safari Club International. McKim, a 23-year veteran with the Department, oversees law enforcement and wildlife conservation efforts in northwestern New Mexico, one of the state's busiest districts because of its trophy deer, world-class San Juan River trout fishery and active oil and gas industry. "Kathy is an all-around conservation officer who sees the bigger picture and works diligently on all issues that affect wildlife," said Brian Gleadle, the Department's Northwest Area chief. "She excels in everything she takes on, from complex law enforcement investigations to coordinating educational events in the community. She is an exceptional representative for the Department of Game and Fish." McKim is a graduate of New Mexico State University. Shikar-Safari Club International was founded in 1952 by an international group of hunters interested in exchanging ideas about the sport. Each year, the club sponsors an award for the Wildlife Officer of the Year in all 50 states, 10 Canadian provinces and the territories of both nations. Shikar-Safari is recognized worldwide for its efforts in the protection, enhancement and preservation of wildlife, and has placed particular emphasis on endangered and threatened species through the promotion of enforcement of conservation laws and regulations.